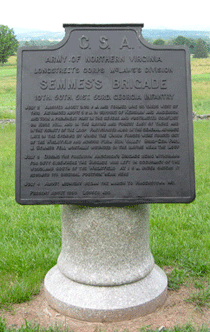 Headquarters markers at Gettysburg come in several shapes and sizes. Four designs represent brigade, division, corps and army headquarters, and each has elements which identify it as Union (left) or Confederate (right). Division headquarters are rectangular bronze tablets mounted on large, rectangular stones. 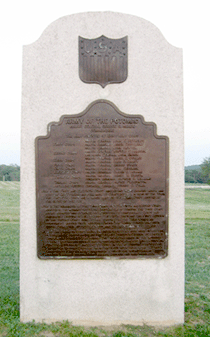 Union headquarters (left, Gibbon’s 2nd Division of the 2nd Army Corps) have a corps or service branch symbol as a separate bronze piece above the tablet, while Confederate headquarters (right, Hood’s Division of the 1st Army Corps) are labeled “C.S.A.” on a separate bronze piece.The two markers to the 1st and 2nd Divisions of the Union 3rd Army Corps (as well as the 3rd Corps Artillery Brigade) break the rule, using the corps marker design (below). 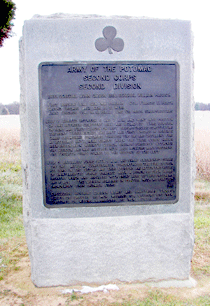 This is to fit in with a common theme of four headquarters markers that are arrayed side by side at the Peach Orchard.There are 22 Union and 10 Confederate Division markers at Gettysburg. Corps headquarters are similar to division headquarters,consisting of a large, rectangular stone. 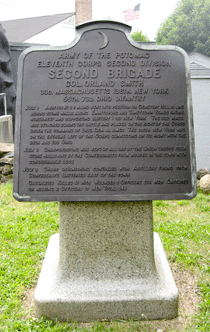 The difference are the brass tablets, which instead of being rectangular have a curved-and-scrolled top.A Union corps or service branch symbol is inset inside the top curve of Union monuments (left, the diamond of the Third Corps). 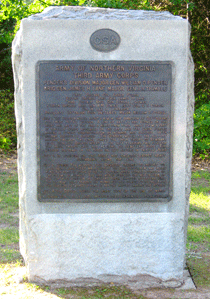 Confederate monuments (right, the 2nd Army Corps) are labelled “Army of Northern Virginia” at the top of the tablet.There are three Confederate and nine Union corps headquarters at Gettysburg; the Union Artillery Reserve is treated as a corps. 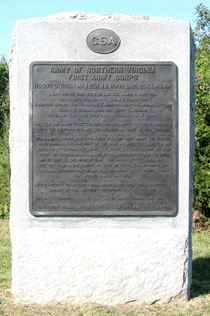 The two army headquarters markers are unique on the field. Although they share the curved-and-scrolled brass tablet top with corps markers, their stones are much taller and have a curved top. 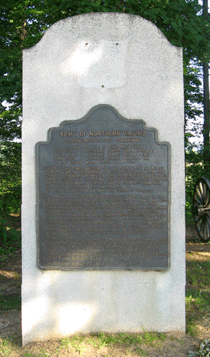 Both Union (left) and Confederate (right) headquarters have a shield attached separately above the tablet, although the Confederate monument was missing its shield for several years. 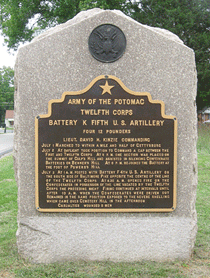 Regimental and battery monuments for United States Regulars (left, Battery K, 5th United States Artillery) are similar in appearance to and often mistaken for headquarters, since they have the same curved-and-scrolled top on the bronze tablet as corps and army headquarters. The difference is that instead of being square, the stone comes to a peak in the center on the U.S. Regulars monuments, with a brass Great Seal of the United States centered within the peak. 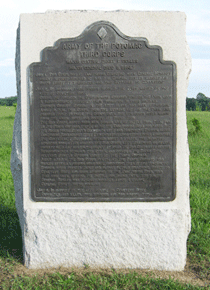 A number of Confederate and at least one Union headquarters have more than one marker. 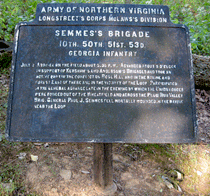 Many cases follow the design rules, but sometimes a secondary marker is a tablet mounted on a metal post (right, Semmes’ Brigade marker) similar to Confederate artillery battery markers.